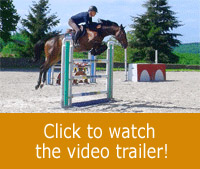 For a majority of riders, approaching fences is a critical phase during which mental and physical tensions can annihilate the correct conditions of a successful jump. ” To see or not see the spot” which is to be able to evaluate or not the distance between the horse and the fence, is part of the mental disruption that affects the rider’s position and therefore the horse’s canter. Of course, it feels better to know if we’re going to be far or close to the fence, granted that the rider is able to react accordingly. 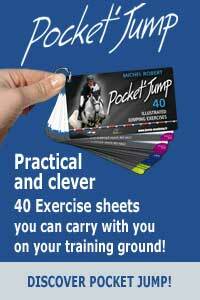 Michel offers in this video, some easy exercises intended to make us understand that “to see the spot” can be achieved at every rider’s level, and that this quality has to be considered secondary to other factors that are essential to a successfully jump. During this session, Michel teaches Lea, a student-rider. He explains the necessary conditions for a successful approach. He insists on what he calls “the quality of the canter” which is essential to take advantage of the ability to see the spot. Lea will experience it by walking on foot over ground poles and by changing the length of her steps and her speed of run. An original session based on simple exercises to be used in everyday life.